Hi everyone! Am excited for this week blog, as I debut my first collaboration with a clothing store known as “HERitage Apparel! Check out the info below about the shop from the owner and check out the pictures of me wearing this beautiful dress and matching earrings from this shop! Belt is not included! 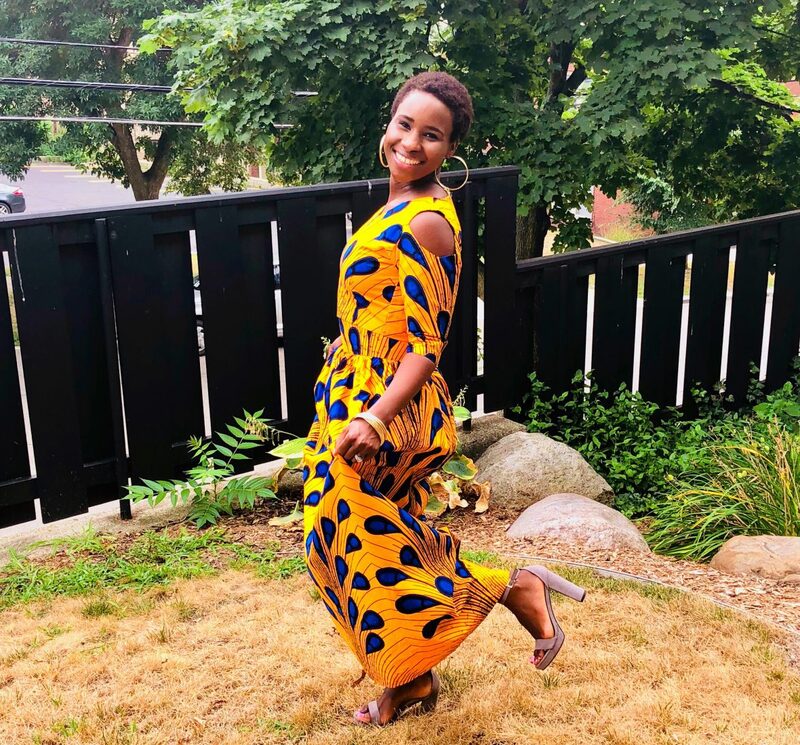 “HERitage Apparel was launched this summer with the goal of bringing affordable, contemporary African-inspired clothing, jewelry, and decor to a larger audience. The company is owned and run by Dee and E., two life long friends and creatives. Dee is an educator who lives in Ghana, Africa. She curates the rich and vibrant fabrics which are then made by E., a writer, who lives in Maryland. The company’s offerings currently include skirts, dresses, tops, statement jewelry, headwraps, clutch purses, and throw pillows covers. A children’s line is expected to debut fall 2018. What sets HERitage Apparel apart from similar companies is their contemporary fabrics, affordable prices, and the fact that they offer free U.S. shipping on every single purchase. In addition, each item is custom made in the USA for each specific customer…HERitage Apparel does not mass produce items and never makes more than 10 of a particular products to maintain exclusivity. I love how this shop is owned by two females who dedicate their time and talents to produce beautiful items! When I was checking out their Etsy store, trust me I wanted to buy everything! It’s love promoting small businesses and so glad we worked together! Check out the pictures of me below and let me know what you think! This week blog is going to be about African Art! I was blessed to grow up around a lot of artists. Despite having lived the majority of my lifetime in refugee camps, whenever we would settle into a new home aka refugee camp, people would continue living their life as if they were still in their own homes. That meant farmers would find new land to grow crops and artists would find a workshop to develop and bless others with their art. A couple of my friend’s dads were artists that made masks and other items and I had the privilege of working for them to sandpaper some of the artwork and paint them. All the art told its own story. From animal artwork to nativities, they did it all! A friend of mine @Nshimmy Charles (check out his Facebook for more of his art); makes incredible beautiful African artwork in my opinion! I love how his art just shows so much African culture! For instance in picture #12, you can see a woman carrying a baby on her back and carrying a bucket of water on her head at the same time and people milking a cow while sitting outside their homes, which is a very popular common custom in a lot of African culture. I own a couple pieces of art and love seeing them in my own home! Picture #5, I bought this item (not sure if it’s name is English), this item is called “igisabo” in my language, it’s a popular item used to keep milk or alcohol in it, is is also used during dowry celebrations in a lot of African culture like Rwandan culture, where a woman brings something for her in-laws to drink. 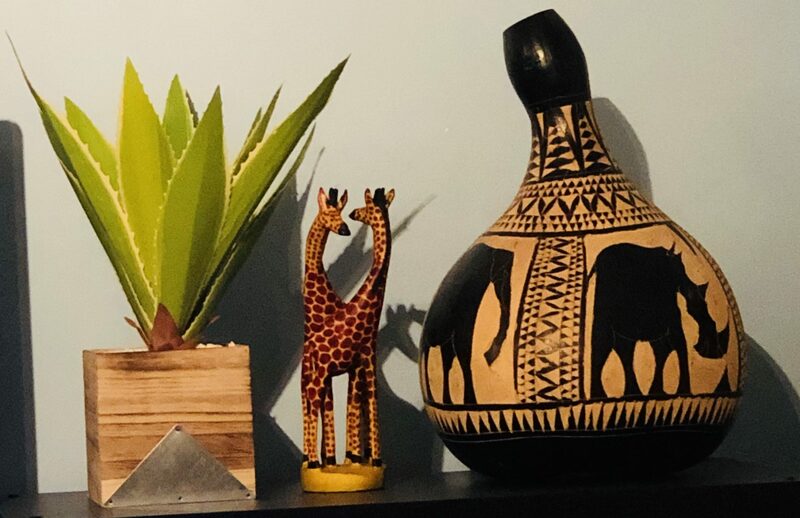 I bought this item from World Market, I happened to be walking around the store and found it and told my husband I had to buy it because I had not seen one since I left Africa! Check out the art work below and let me know what you think! , a nonprofit organization based in Grand Rapids, Mi, whose mission is to help provide menstrual sanitary pads to women in need, so if you have some products you are not using and want to donate them, let me know! Christine, who started the nonprofit sells jewelries and used the funds for the nonprofit, how cool is that? The bracelets are from Etsy store called @BijouxMinuit, they are made out of beads that popular from tribe in Kenya and Tanzania known as Masai, I will do more post about this particular tribe and their jewelries later! !Check out the outfit below and let me know what you think! Don’t forget to click follow on my blog! Below are some picture of me rocking some African prints,let me know what you think.